Thank you to everyone who attended this year’s George Tragos/Lou Thesz Professional Wrestling Hall of Fame weekend. For those who were not able to attend, we hope you can make it back next year. Next year’s event will take place July 14-16, 2016. All-access passes for the 2016 Hall of Fame weekend available for $80 (regularly $100) if ordered by August 1, 2015. Below is a recap of event activities. Thank you to Rob Schamberger for his work on the 8′ by 12′ mural in the National Wrestling Hall of Fame Dan Gable Museum lobby. He worked all week to make it happen, and the payoff was our best piece in the museum. Be sure to read the article on the artwork by reading the below article. Rob also donated over 40 pieces of art to the museum. This is the second year he painted the current class of inductees too. He is THE artist of the National Wrestling Hall of Fame Dan Gable Museum. We are fortunate Rob is involved. Troy Peterson and Impact Pro Wrestling make the George Tragos/Lou Thesz Professional Wrestling Hall of Fame weekend happen. They hang posters, provide volunteer support, and implement changes to the museum. Troy and company are responsible for the Mat of Honor, the Tragos/Thesz ring renovation, the Jim Ross audio tour, and the video compilation of historic wrestling matches. They also created and hosted the trivia contest. They are, without a doubt, the best and most invested independent professional wrestling promotion in the nation. Kurt Angle, a 1995 World champion and 1996 Olympic champion, made his first visit to the National Wrestling Hall of Fame Dan Gable Museum. Angle was inducted into the George Tragos/Lou Thesz Professional Wrestling Hall of Fame in 2012, but was unable to attend. Museum namesake Dan Gable spoke about Angle’s influence in wrestling before full house in the George Tragos/Lou Thesz Professional Wrestling Hall of Fame wing. Angle called Gable the greatest wrestler ever and went so far as to say that Lou Thesz was the greatest professional wrestler ever. He then read a letter that Thesz wrote Angle before Thesz’s passing. Angle signed the Mat of Honor in the professional wing, the Olympic champions wall in the Olympic Pavilion and the NCAA champions’ mat in the Dan Gable Teaching Center. It was a historic moment for everyone involved. Troy Peterson celebrated his 42nd birthday on Sunday, July 1. Baron Von Raschke, Gerald Brisco, Jim Ross, Nick Dinsmore, Bill Murdock, Beth Phoenix, Rob Schamberger, Brian Blair, Jim Brunzell, Steve Johnson, and Matt Lindland held up a sign that read “I’M A FAN OF TROY PETERSON AND IMPACT PRO WRESTLING.” There are pictures of all 12 holding the sign on the George Tragos/Lou Thesz Professional Wrestling Hall of Fame Fan Page. We are all fans of Troy and the work he does. The National Wrestling Hall of Fame Dan Gable Museum received a $1000 check from JJ Dillon and the Cauliflower Alley Club during the induction banquet. The National Wrestling Hall of Fame Dan Gable Museum is honored to be associated with such a great organization. It was also special to have JJ Dillon of the Four Horseman in attendance. He is a class act. 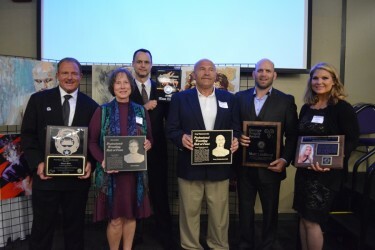 Joyce Paustian, Chad Olson, Tim Dalton, Bill Murdock, and Steve Schmitt have attended every Tragos/Thesz Hall of Fame weekend and every Tragos/Thesz Hall of Fame banquet. Who will break the streak first? Hopefully no one! Be sure to check out all of the coverage from Kari Williams on SLAM! Wrestling’s website. She covered all of the weekend activities. Below is link to her stories on the induction banquet and her story on Kurt Angle’s appearance. Cody Saveraid hosted an excellent panel discussion on Jack and Gerald Bricso during on Saturday, July 11. Gerald donates all of his time to the museum. We couldn’t do it without him. Bill Murdock, 2007 Lou Thesz World Heavyweight Championship Award winner, was promoting Headlock on Hunger during the Hall of Fame weekend. Bill is the executive director of Eblen Charities, which champions the cause. Be sure to learn more by visiting headlockonhunger.net. It was an honor to have the namesakes of the George Tragos/Lou Thesz Professional Wrestling Hall of Fame in attendance this year. Bill Tragos, son of George Tragos, and Charlie Thesz, wife of the late Lou Thesz, both participated in weekend activities. We appreciate their investment, and we appreciate that Charlie made five airport runs. This was the fourth consecutive year that Jim Ross attended the Hall of Fame weekend and the second year he was the Master of Ceremonies. He also donated barbecue sauce to the museum as a weekend fundraiser. Thanks to Jim for his consistent support. Congratulations to his year’s class of inductees. Greg Wojciechowski, Jim Londos, Brian Blair, Beth Phoenix, Matt Lindland, and Wade Keller were very deserving to enter the Hall of Fame. It was very special to have everyone in attendance, and it was special to have Christine Londos accepting on her father’s behalf.